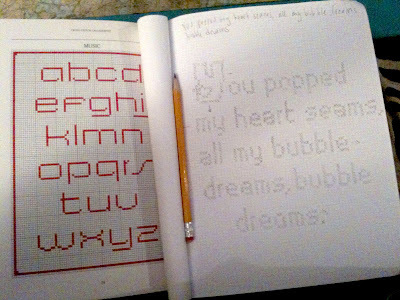 So being a little obsessed with Lady Gaga, I though I'd make some cross stitches of her lyrics. My favorite song now is Speechless, so here is a hint of the first steps of making Speechless lyrics be fabulous wall hangings! You know I might need one of those right? My favorite line of that song is "I'll never write a song, won't even sing along." Way too sad for a cross stitch. I have an amazing idea for one actually. Two pictures of a pretty cherry and then two old school batman like BOOM BOOM's. That is my genius idea for the day.